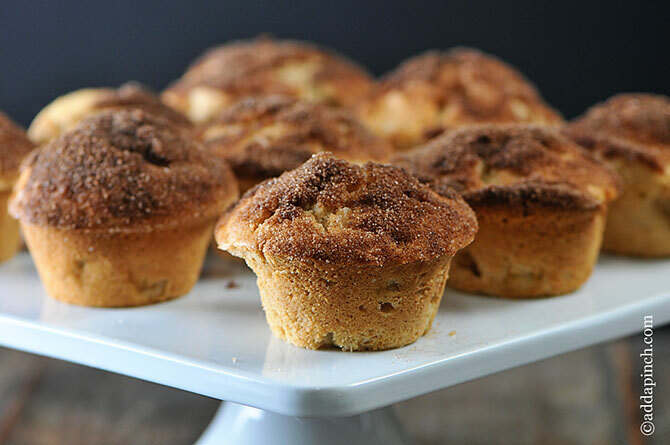 Cinnamon Apple Muffins just kick my mornings off to the perfect start. Full of warm, spicy cinnamon, delicious crisp apple bits, and so, so scrumptious they are hard not to start anyone’s morning off in the right direction, honestly. And believe me, when autumn rolls around, these babies are in high demand. In reality, they are perfect as a year-round breakfast treat, but for some reason, I immediately associate them with cool autumn mornings with all that cinnamon and apple deliciousness they have in their favor. And luckily, these babies definitely have lots going on in their favor! 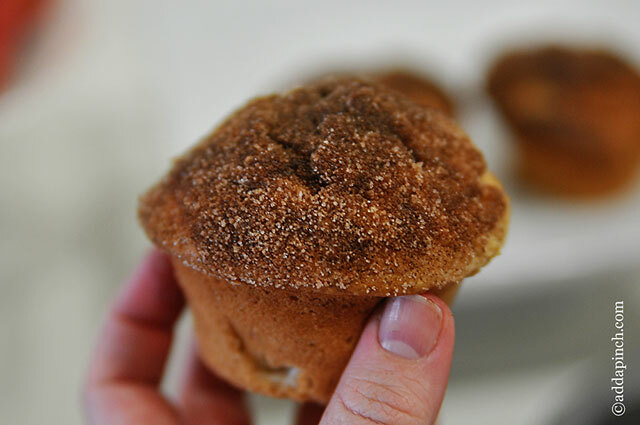 These cinnamon apple muffins use just one apple to make a dozen muffins, but if you prefer more apple bits in your muffins, by all means, I’d increase it to two. Dice them small so that the pieces of apple aren’t overwhelming when you take a bite of muffin. You want every single bite to be well-balanced in flavor and texture. You can use whichever baking apple you prefer. 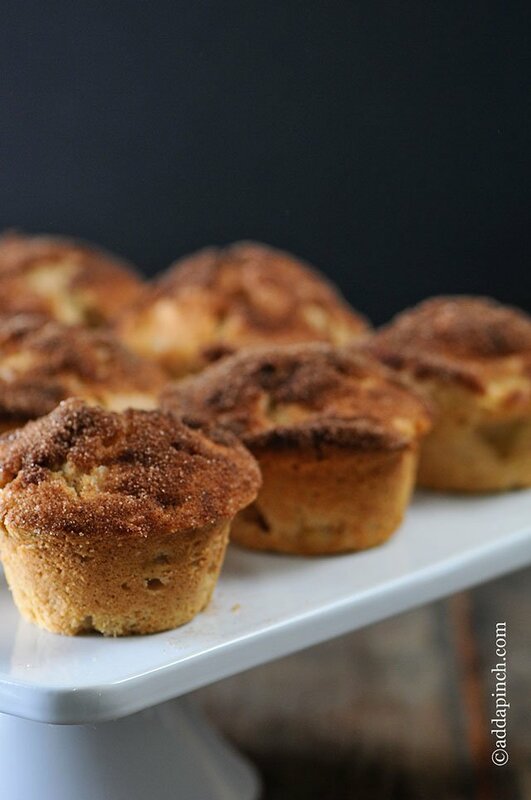 I like to use Braeburn, Rome, Jon Gold, Gala, Granny Smith, Honey Crisp, and SweeTango apples in these muffins. I also like that when I bite into the apple pieces, I still know that it is apple and not make me think it is applesauce or apple butter included. Don’t you? Along with apples, flour, sugar, cinnamon and vanilla, you’ll just need some butter, milk, baking powder, salt, and eggs. 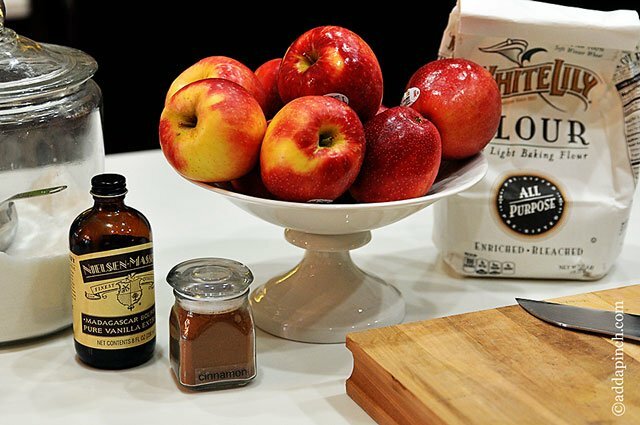 The classic ingredients for a cinnamon apple muffin, I think. Nothing weird here. Once the muffins are in the oven baking, I like to brown a little bit of butter and mix together a bowl of cinnamon sugar. 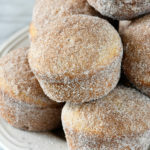 Then, once the muffins have cooled slightly, I dip the tops of the muffins into the slightly warm brown butter and then into the cinnamon sugar mixture. Amazingly enough though, folks don’t just eat the tops of the muffins and then forget about the sweet little base. They gobble the whole thing up it’s so well balanced in flavors. But, just in case you were wondering, you can skip that indulgent little coating on the top, but I seriously recommend you don’t. Skipping it is pretty close to a sin, I’m sure. Here’s my Cinnamon Apple Muffins. Make them soon. 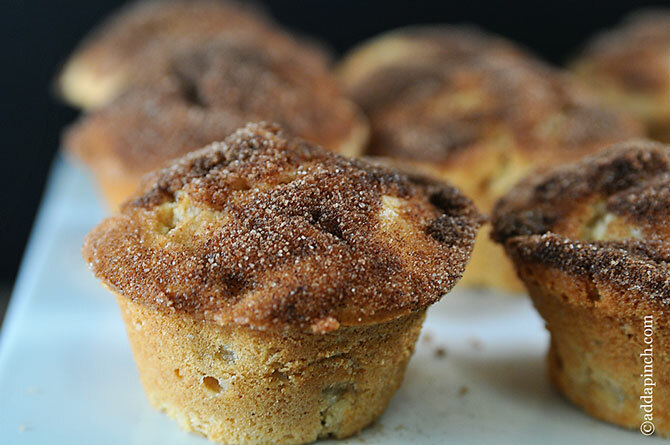 Cinnamon Apple Muffins make the perfect addition to any breakfast. 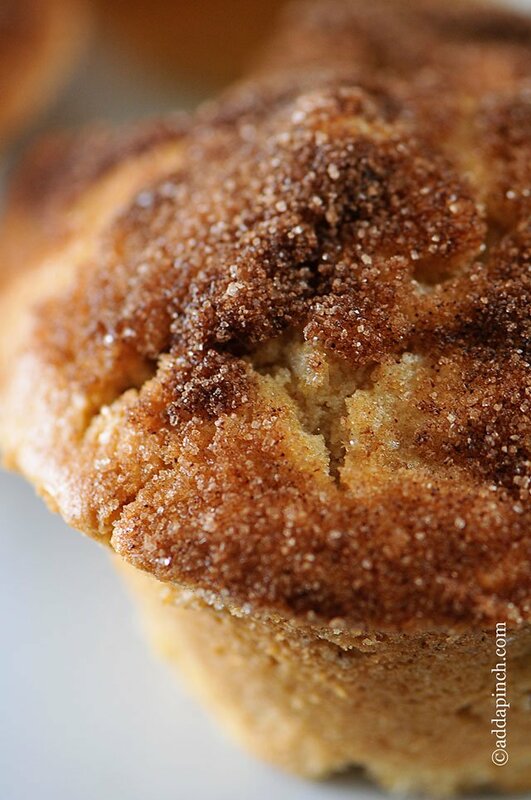 Get this family favorite recipe for Cinnamon Apple Muffins. Toss together diced apples and 2 teaspoons of flour to coat apples in a separate bowl. Set aside. Gently fold in flour mixture, alternating with milk. Stir until just combined. Fold in diced apples and scoop mixture into prepared muffin tins, filling about 2/3 to 3/4 full. Bake until a toothpick or skewer inserted in the middle comes out clean, about 30 minutes. Once muffins have baked, remove from the oven and allow to cool slightly in the muffin tin. Then, remove each muffin and brush the butter on with a pastry brush (or dip into the melted butter) and then into the cinnamon sugar mixture. Place onto a plate to finish cooling. The original recipe called for a 1 to 1 mixture of sugar and cinnamon. If you prefer a less cinnamon flavor in your topping, reduce the mixture to 1/4 cup granulated sugar and 1 teaspoon ground cinnamon. Loved these muffins! Was thinking about baking the entire batter recipe in a loaf pan instead of muffin tin. Do you think one recipe would be enough for a loaf. Also, how much should the baking time be increased? 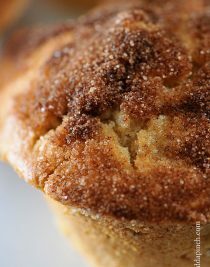 Such a great cupcake/muffin for a colder day! Changes I made : Added a dash of honey and did not making the topping. I cooked these at 200C for 10-12min. The ratio of ingredients are great for a nice fluffy cake. Not dense or wet. The muffin top has a nice crunchy crust. I’m planning to make these today and have a question. 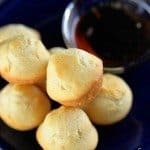 If I want to make these as mini-muffins, how long would I bake them? And if it’s closer to 15 minutes, will the apples get soft enough? Thanks!! This is probably too late, but in case it’s helpful for anyone in the future, I make these as mini-muffins and I bake them for about 20 minutes (check at 15, but usually they take about 20], and as long as I dice the apples really small, they definitely get soft enough. Delicious! I also always use 2 apples for even more apple-y flavor. So easy to make and they’r presently in my oven just now. The smell is divine. Perfect for this time of year! Hello, I’ no baker but thought I would give your recipe a try. I baked a dozen muffins, absolutely delicious !!! That’s a first for me. Would it work as well if I poured the batter into a loaf pan? Need a coffee cake for Sunday brunches . So glad you enjoyed the muffins! Aren’t they scrumptious?! Wonderfully light and flavourful. I used a silicone brush to spread some melted butter on the tops and then spooned the sugar cinnamon on top. They were great! So glad you liked them, Susan! I made these last night and they were just okay as written. I dipped the warm muffins in the butter and cinnamon sugar as directed but I didn’t care for the results. I made a second batch and put a simple streusel topping on before baking and they were delicious. The muffins themselves were very good last night but today (the leftovers) are very dry. 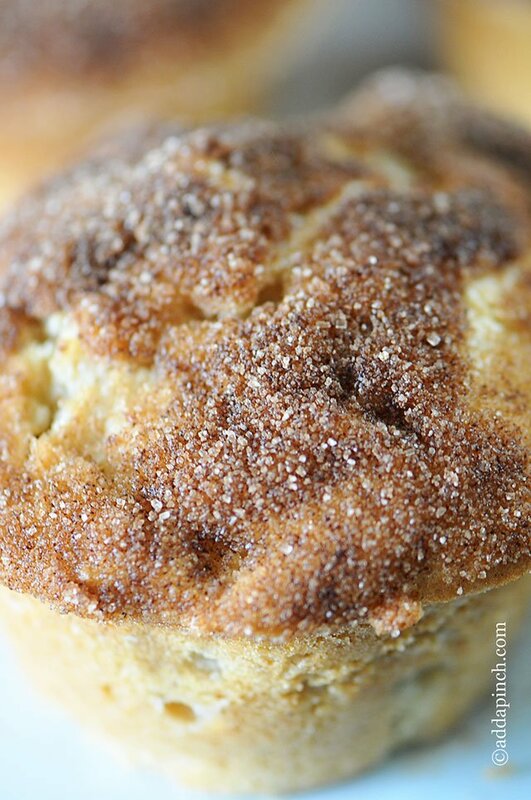 I would like to continue to use this recipe as my guide for apple cinnamon muffins but I will experiment with the addition of another ingredient to try to make them a bit moister. My sister recommended trying some applesauce or maybe a vegetable shortening to replace some of the butter. I will report back. Wonderful to hear, Jonah! 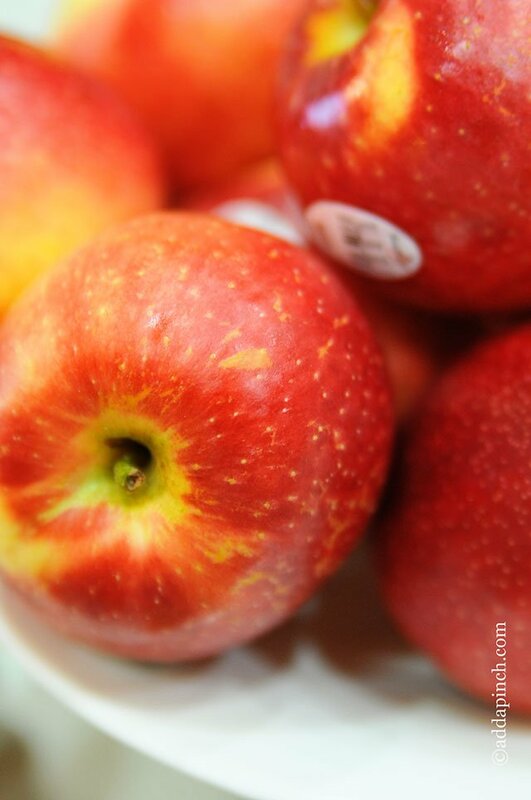 Fresh apples are so great to have! Thanks so much! Fantastic recipe! It’s true, the flavor is so good you won’t just want to eat the top and leave the rest. We used Honeycrisp apples for ours. Can’t wait to try it with other apple varieties! This is going to be a staple for us. We are a “chunk adverse” family, could you advise on an amount of applesauce or Apple butter i could sub for chopped apples? Try shredding the apples instead if chopping. Definitely on my make again list! I used tart apples from a tin. I am happy you enjoyed them, Astrid! Thanks! Really enjoyed these muffins! They are easy to make and absolutely delicious. I followed your recipe, but just sprinkled turbinado sugar and cinnamon on top before baking, instead of the topping. Thank you for the perfect apple muffin recipe. Thanks so much Robby! Glad you enjoyed them! 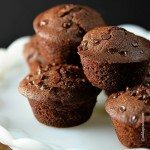 These muffins were a hit at my home. I didn’t make the the coating but either way DELICIOUS. I’m about to make them again! These were the perfect treat! The topping was a little to gritty for my liking so didn’t use but served 21, added a little more sugar & vanilla! So good!! Thank you! If I made the mixture overnight, and baked the muffins in the morning, would that be okay? Also, would substituting whole milk make the muffins more moist? Thanks! 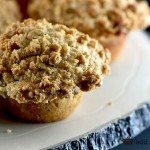 Super easy n fast to make..
I’m a big fan of oats in my apple muffins what would be best for incorporating some into this recipe. I made these on Saturday. They are so darn good!!! I did use 2 apples and did the cinnamon/sugar topping. I will definitely be making these again, the only thing I will be doing different is I’m going to try a strusel topping. Definitely recommend this recipe!! Hello could you provide the recipe in metric mesurements (in grams / ml) rather than cups? Many thanks. Here is a link to my Conversion Chart. Hope you enjoy them! I have made these muffins twice now in the last two weeks for adults and grandchildren. I made the mini version and followed the recipe. Delicious! Thank you. Best recipe ever! Delicious! I didn’t want to waste cinnamon, so I just started with the 1/4 cup sugar + 1 tsp cinnamon topping. That worked out great and definitely enough flavor. Just made these today with my 10 yr old daughter. My whole house smells delicious and the muffins were amazing!! My husband doesn’t normally like fruit based baked goods but, he ate four of them!! Definitely a recipe we will use often. Thank you so much for sharing. I’m not sure what happened, but my muffins wouldnt come out of the pan. They were falling apart. Super good, but they fell apart. I did spray the pan, and followed the recipe exactly. I’m sorry your muffins fell apart, Sydney. I’ve never had mine do that and always have great results. Thanks. THE. BEST. Thanks so much for sharing!! Delicious, made these according to recipe, except added 1 tea. cinnamon to the 2 tea. Flour on the apples. Also before baking sprinkled tops of muffins with cinnamon/sugar and wheat germ mixture. Wonderful, big hit with family. Sounds like a yummy recipe! I plan to make these soon, but have a question. Do you peel your apples or leave the peel on? Thanks! 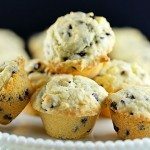 Made these exactly as written and they have become our favorite muffin recipe! Thank you for posting this! Glad you enjoy them too, Gen! Thanks!!! So-due to not having all the ingredients…. this is what I did and it was great. Hi, I was wondering is there any way to add banana into this? 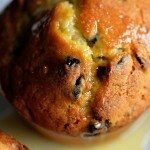 I’ve never added bananas to this muffin recipe, but I do have some banana muffin recipes you may want to try. Thanks! Hi. I used nutty wheat (whole wheat flour) and it came out great. Thanx for sharing the recipe. My family loves it. Thanks, Anette, for sharing your way of making this. So glad your family enjoys these muffins.